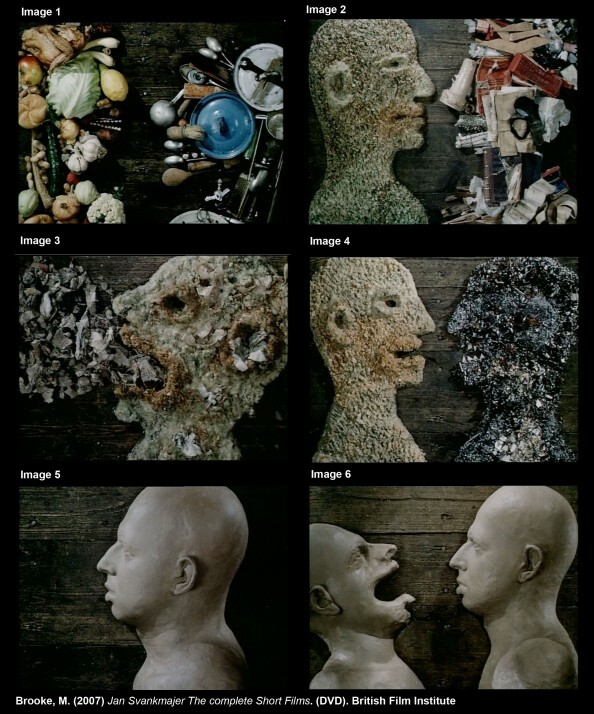 This part is represented by human-like heads made out of common objects such as books, brushes, spoons and even vegetables. Those busts wonder around (don’t ask me about their means of locomotion) and devour each other until you can’t tell what they were and what they’re made of anymore. The entire process of digestion is shown object by object. Basically you may find out some new rules to the rock, paper, (vegetables,) scissors (and plastic) game: scissors cut apple, books mash metal, spoons crush radishes, paper beats shaving brush, envelope beats thimbles or vegetables eat paper. Looks like someone got bored of rock paper scissors and wanted a real challenge, right? My belief is that it is only a euphemism for the way we take in, digest and re-transmit information. Each time we give someone a new piece of information regardless of what it is, it’s going to be contaminated by our own thoughts and ideas. And this cross-contamination continues until everything or better yet everyone is evened out. The second part of this short film deals with the dialogue between lovers. The opening scene of this second act depicts two clay figures, a man and a woman sitting at a table. They approach each other shyly, holding hands and then engaging in a very passionate kiss. 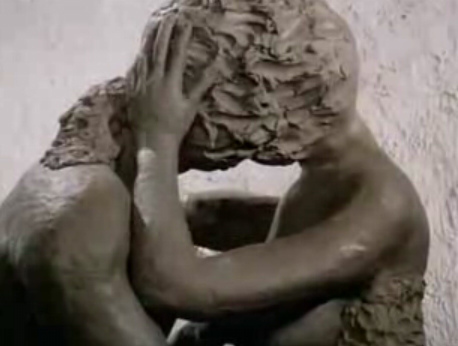 The two clay figures merge in a kiss and then a fervent sexual relationship which isn’t explicitly shown. After the two figures separate again, and extra piece of clay between them becomes an apple of discord that incites them to grueling acts. Could it be that everything is well in a relationship before an unwanted child appears? Or could it be that sometimes we search for the smallest of reasons to argue with someone although the argument is due to underlying causes? But if dialogue is Eternal and Passionate, it can’t but be Exhausting. And this is shown in the third part of this short film. Two clay busts of older men sit in front of each other, connecting in logical ways. They each stick out on their tongues various objects such as toothbrushes, slices of bread, shoes, pencils, pencil sharpers, butter, laces and toothpaste. At first, everything goes smoothly; one puts out a shoe, the other one the lace, one puts out the pencil, the other one the sharper and so on and so forth. But then they switch places and everything is staggered. The director combined those eight objects in all possible ways. The results are buttered shoes, sharp toothbrushes, laced bread, or penciled shoes and are indeed fun to watch. But after this second change comes a third one in which the two simply stick out the same objects and destroy themselves. In the end, the elderly men are simply weary of so much communication. Is that sometimes we get along so well with someone that it all seems perfect until we switch places? Or maybe sometimes when we’re expressing our needs becomes so tiresome because no one seems to understand them? In communication we may find people that complete us and thus communicating with them comes natural; or we may encounter people that disagree with us and/or cannot understand us. Equally correct is the representation with magnets that have the same pole reject each other. In the latter cases though, dialogue may prove to be tedious and exhausting. 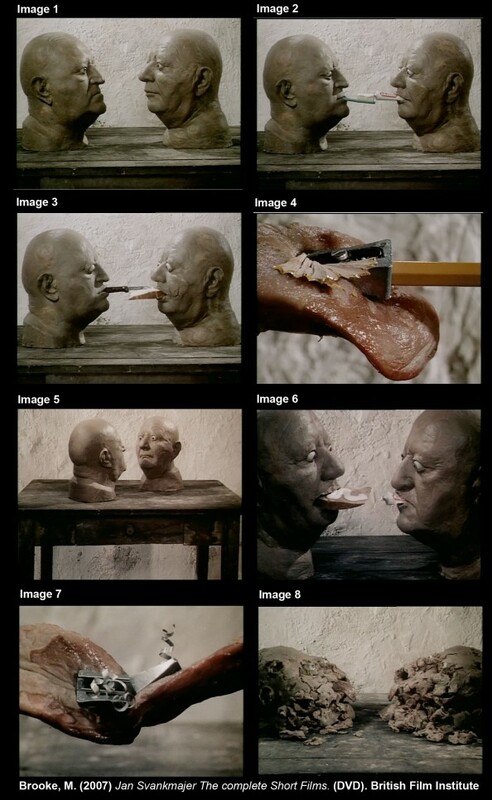 According to Svankmajer, dialogue has 3 dimensions: one is eternal, the other passionate and the third exhausting. But is dialogue really like our 3D reality or is it more to it? And if there’s more, what would the fourth dimension of dialogue be?